Picking tends to happen quickly, arbitrarily, or without consideration for others. We pick holes in things and others, pick sides, pick fights, nit-pick, are picky picky picky, pick up bad habits, buy some “pick your own fruit,” act in a “cotton-picking” way, cherry-pick, remind people that “sweetie-pickers wear bigger knickers” (sorry about that one), or enjoy Brain Pickings (this one’s good, there’s always an exception). There are some things in life we should do in a hurry but not as many as we think. 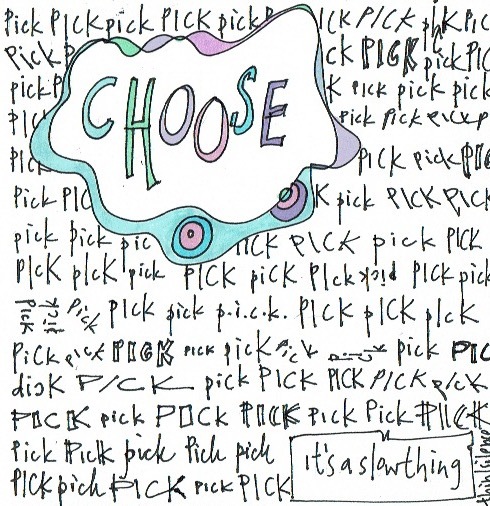 To choose is to be more noticing and thoughtful. More can emerge from the small, life happens in the little. Just pick something can be tantamount to saying anything is better than nothing. Choosing slows us down allowing us to spot something where we thought there was nothing.